There are so many planner page layouts available, from those from Filofax and Franklin Covey, to those like DIY Fish and The Happy Planner. There are just as many planner systems. From my own Giftie Etcetera system to Getting Things Done to the 7 Habits, people are forever creating and tweaking methods for organizing our appointments, tasks, and goals. 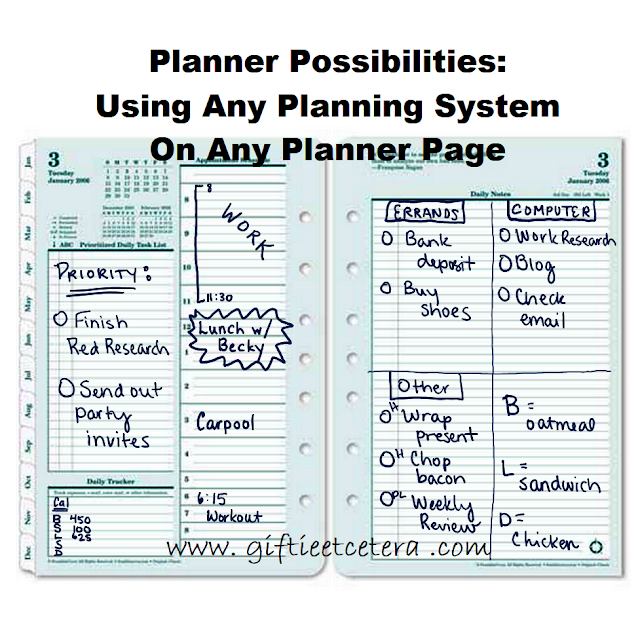 Newsflash - your system of choice does NOT have to match your planner pages perfectly. I usually show examples of my own system, but for today's purposes, notice the standard Franklin Covey 2 pages per day format. Instead of using the 7 Habits system (with priorities like 3A or 1B), I am using a combination of Getting Things Done (with context-based task lists and tasks written with a verb at the beginning word) and the Giftie Etcetera scheduling system. I'm using parts of the page to record calories and part to plan dinner. The point is that your system does not have to match your pages. Decide which pages work for you. Decide which system, with adaptations as needed, works for you. That is the way you should plan! It doesn't have to be all or nothing. In fact, if you stick to all or nothing, you'll soon find out that no one system works, even on its custom-made pages. I have tried many different systems until I found one that works for me. Sometimes I will still see a suggestion or something that someone does differently and will love the idea. So, my system does change sometimes. Another "Aha moment." I've used the Do2P layout for many years but always felt it was too businessy. Here's another tweak to add to the arsenal. I use FC Compact Wo2P , but still feel cramped. This fills my need for "white space"Thank you for sharing this. Do2P = Day on 2 Pages? I used to use a FC Do2P and I would put work tasks at the top going down and personal tasks at the bottom going up. I'm thinking that could be done with other divisions as well. This would be the perfect way to use up old planner pages that you tried but didn't like, but couldn't bring yourself to get rid of because you paid for them. Great idea!